This morning I worked in my son's Mom's Morning Out program. With twelve kids ages 2 to 4 and a baby on my hip, I am always looking for easy crafts that don't require too much adult assistance (since we only have one other adult). This past week we got a box of crafty supplies from Craftprojectideas.com in the mail. I really wanted to use some of the materials with the kiddos, so I brought along the Ultimate Fuzzy Kit... and we created some Pumpkin Puppets! 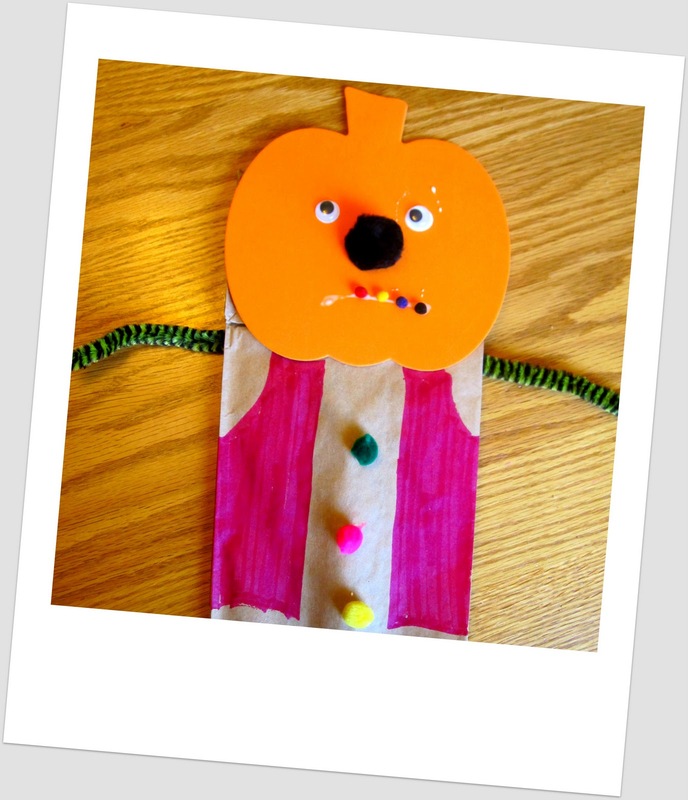 Materials Needed: foam pumpkins, Ultimate Fuzzy Kit, brown paper bags, crayons/markers, and Elmers glue. 1. We started off by designing our pumpkin faces. Some kids only wanted a nose and two eyes and then drew a mouth... some kids wanted lots of eyes. We used wiggly eyes and poms on the pumpkin faces and then they drew with crayon or marker. 2. Then they decorated the bodies (brown paper bags) of their pumpkins. 3. 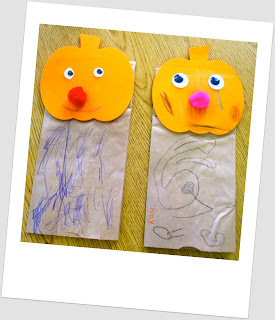 At the end they glued their foam pumpkin heads onto the top flap of their brown paper bags and we set them aside to dry! As we worked on this project I kept many of the materials close to me to help foster communication amongst the kids. When they needed something, it wasn't immediately reachable. We practiced asking for tools and materials that we needed and we practiced asking for help. We also practiced asking our friends for help (not just the teacher). It makes me so excited when little ones are using tools and then say to a peer, "Can you please pass me the ___?" or instead of yelling, "I need REDDDDD!!" I've discovered that some parents (I have been at fault for doing this once or twice :)) just immediately respond to the "I need RED!" statement and pass along the red crayon without thinking twice about it. I've also been the recipient of these sort of students 3 years later and it isn't as cute when they are 5, 6, and 7 and yelling or demanding things. I love it when there are activities that allow me to practice these basic polite communication/sharing skills with kids. It is easy to motivate kids to communicate properly/clearly/politely when they really want some wiggly eyes or poms. Once we were done we had super cool pumpkin puppets to play with! Just in time for Fall! I love it when the process and end product encourage speech and language development. Puppets are such a great tool to encourage communication! I love this article that explains why puppets are such a valuable educational tool. Thank you Craftprojectsideas.com for some fun materials! We are excited to keep using them to create even more fun projects later this week. Disclosure: As mentioned above, I was sent a free box of craft materials from Craftprojectideas.com to do what I wished, I have not been paid for this post.